Even people who did not grow up with one of the Triad of religions that uses Moses as a foundation figure are familiar with him, either from reading their religious book at their parents' side or because of the iconic version played by Charlton Heston. 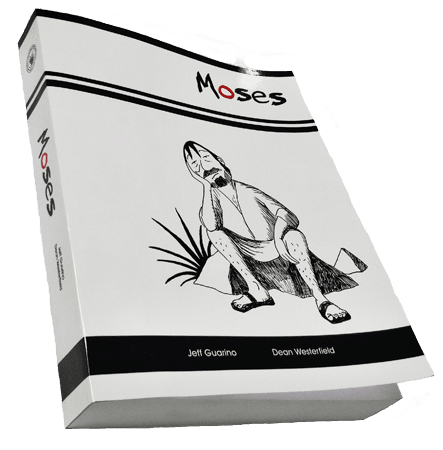 In an extremely ambitious project, Jeff Guarini and Dean Westerfield take a different path, making Moses a man who tells stories (some of which are familiar) while living out his life trying to avoid taking a leadership role among his people (some of whom are familiar). His life and his stories play out in a larger backdrop of living, dying, and loving in an expansive work that tries just a bit too hard and ends up falling down a bit under its own weight. I really liked the concept of this graphic novel. Without getting myself into a theology hole, I think that most who have faith but do not assume a literal reading of the text understand that the idea of Moses as a singular writer of the early books of religion is unlikely to be true. He's more of a Homer-like figure, used to attribute sources to. As with the Greek poet, there may have been one major figure who told most of the stories, and he likely lived a life that was not unlike that shown by Guarini and Westerfield. That's where this story really shines. Watching Moses struggle with being a notable figure within his community but not wanting to take on the pressure of leadership, leading to a rather complicated situation within the larger society is fascinating to watch. When there are discussions of Pharoahs and Moses' own somewhat ambiguous history (I'm not sure we saw a definitive background and I like it better if my reading was correct, but I may be wrong on this point. ), it's nice to see the creators weave in and out of the familiar. Seeing Moses age over time, until he's barely able to remember where he lives, often sleeping with the written versions of his stories, is really touching. Similarly, I loved seeing the lives of those around him, as they, too grew and aged. Gossip flows, battles are fought off screen (allowing them to become stories as well), and certain relationships are established over time. 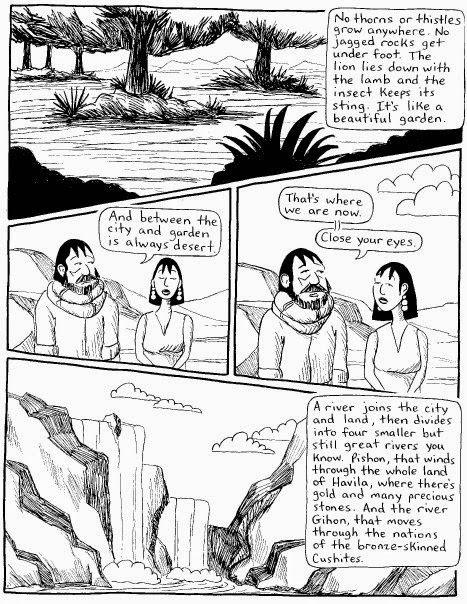 Set in a lovely background that features amazing black and white linework by Westerfield, I felt myself wanting to stay with and linger in Moses world. Ironically, however, where I had the most issue sticking to the story was when Moses was giving different versions of the things I'm very familiar with, either in the Bible itself or those stories which reportedly did not make the cut. I give the team credit for using various origin stories for Adam and the Garden and giving Moses a chance to worry over what happens when oral stories are written down, but every time after the first few that we moved into story mode, I could find my attention drifting. There's nothing wrong with Guarino and Westerfield's adaptations, either. They're extremely well drawn and the changes are either from using alternative versions or by taking liberties with the text. If you put aside any offense you might have at their decisions, it's really stellar. The versions of Job and Jonah in particular really stuck with me as set pieces, especially when we see Jonah being beaten to death but Moses lies to the children and gives him a happy ending. The visual isn't bloody at all, but Westerfield gives it exactly the right body language, even as Moses is telling about how he dedicated himself to bowl-making instead. Guarino seems to know just how much or how little to say, giving Westerfield a lot of room to work. There's a ton of facial reactions, especially by Moses, and little changes in hair, noses, and beards make it easy to tell that the characters are different (though due to the length and story digressions, I did sometimes find myself having trouble remembering who was who). He gives them a lot of time to emote, often making sure to linger on a theme or image as well. Though the backgrounds were not intricate, I felt like I new the type of life Moses was living, thanks to seeing the houses, their insides, beasts, and even a well or the odd tree. Mixing them in organically while Guarino picks what to talk about (politics, legends, relationships, etc.) based on the situation means we don't have to waste pages talking about exposition. On the other hand, these sometimes sprawl a bit, and in a book with so much going on that's not always the most helpful thing. It's really pretty to look at, and see how Westerfield changes his pencil and ink work (the whole book was done without digital editing) depending on the situation. It's nice to see some imperfections in the depictions that aren't "cleaned up" in Photoshop, but I am a bit old-fashioned that way. The problem Moses has is that over the course of such a long book, it's hard to keep track of things, and even taking reading breaks didn't help. 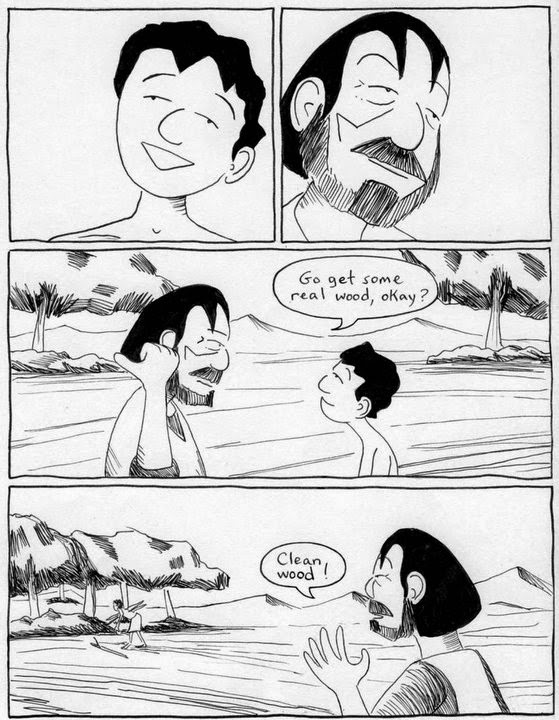 I started losing the thread of Moses' narrative, and the key moment where he's maybe talking to God (another great set piece by Westerfield in which Moses, out in the mountains, talks to the black space with just a bit of stars, casting doubt on his sanity) really gets lost. Perhaps it's my failing as a reader, but I don't want to have to bookmark or take notes just to enjoy a graphic novel. Flipping back and forth should be a choice the reader makes, not something out of necessity to ensure they didn't miss something. Moses is an amazing achievement that Guarino and Westerfield should be extremely proud of creating. I'm definitely interested in their next project together. But it's hard to recommend this one unless you as a reader are really up for a challenge or willing to deal with some flaws that damage it as a whole. In its attempt to do so much, Moses becomes much like reading a project that isn't quite sure if it's going to be about Moses himself or the stories we've come to associate with him and the three One God Only religions that share so much.